Makes 1 - 4 cups of coffee. 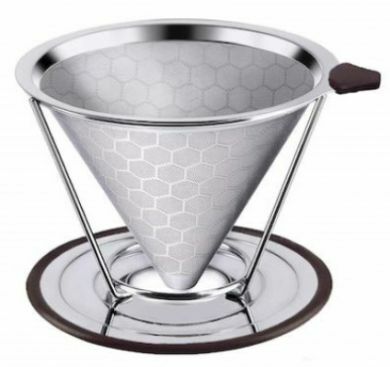 No more grounds ending up in your cup with our reusable double mesh coffee filter. Unlike disposable paper filters which rob your coffee of essential oils and nutrients this dripper allows all of the flavour through into your cup. Made from BPA free 18/8 (304) hygienic stainless steel the double mesh filter stops the smallest of grounds but whih allows the coffee oils to flow through for a richer, better tasting coffee. Easy to use and clean. Brewing fresh coffee with our pour over coffee maker could not be easier. Never buy or discard another coffee filter again. The built in stand is designed to fit on most cups, mugs, thermoses, small pots, and even carafes. This brewing method is as quick and easy as automatic brewing machines. It can easily be cleaned. Just place it in your dishwasher or rinse well with hot water after brewing.